First used in 1968, Vespa is recycling the Primavera name in 2014 with a 50cc two-stroke and two 3-valve four-stroke versions (125cc & 150cc). We recently tested all three. 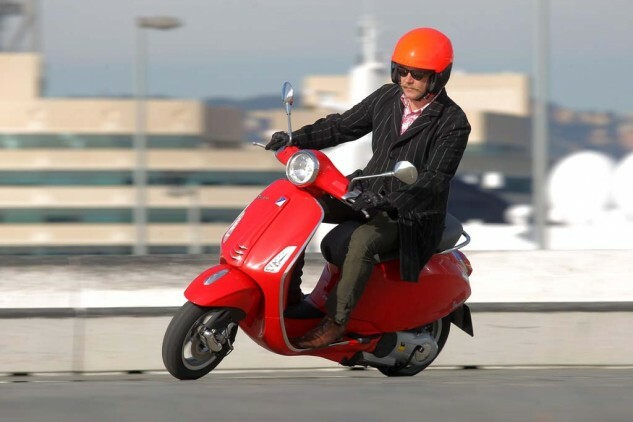 Vespa sold 162,000 units in 2012 for parent company Piaggio. 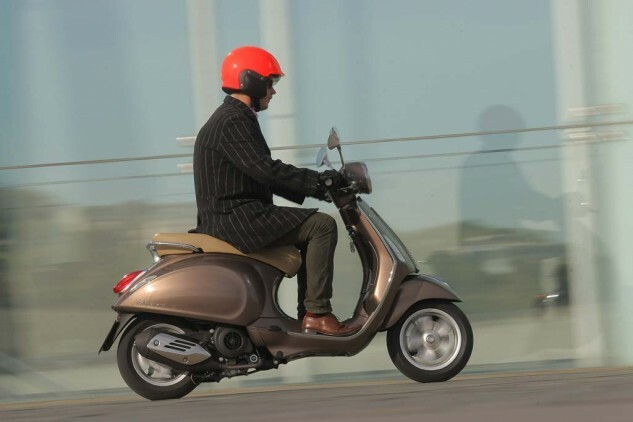 In 2013 Vespa has already seen 40% growth as of last quarter and is hoping to beat the 2012 figure this year. Vespa is unarguably one of the biggest brands in the two-wheeled industry. Being a former 50cc PX owner myself, it was time for me to jump into the saddle of Vespa’s latest model and give it a spin around one of Europe’s best known cosmopolitan cities, Barcelona. Compared to the LX the Primavera has an all-new metal body with improved legroom and a closer reach to the ground for shorter riders without cramping taller ones. I’m no authority, but I’d venture to guess that those who wear high heels will also feel comfortable on the Primavera. The main new development is a more stable chassis and new front suspension tweaks to reduce vibrations. 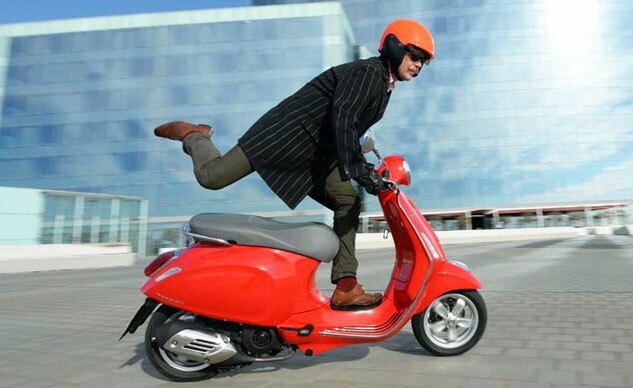 The Primavera offers an easier reach to the floor than the LX, which the new Vespa is expected to replace. Using the trusty “let-go of the handlebar while rolling test” for the new front end quickly satisfied the fact that I wasn’t going to crash and the Primavera would roll with much more stability than the LX. It doesn’t take much to change the weight distribution of a Vespa and controlling the movement of the small scooter just takes little adjustments. Even an old fart like myself starts feeling forever young in the seat of the Vespa Primavera! While filming by Montjuïc castle aboard the 125 version, I met a Catalan skater called Jordi and decided to give him a lift up the steep hill with the Primavera. The perfectly placed pillion grab rail at the back made the small Vespa a very suitable extreme sport helper much like the jet-skis dragging surfers into position for the perfect surf. As far as power, dragging our Catalan skater friend up the hill was no problem for the 125. The new chassis and suspension updates make for a more stable ride. The Primavera is comfortable, more so than its 3V siblings the LX and Sport, and you can equip it for touring with chromed luggage racks. If you go this route, the 150cc version is then best for that extra oomph needed with the extra weight. Under the Primavera’s comfy seat we find a 4.4-gallon storage compartment which will take a full-face helmet with ease or a full bag of groceries. At traffic lights the Primavera 150 is very handy and the initial torque response from the engine propels us forward in satisfactory fashion. The official fuel consumption figures stipulates a 186-mile range from its 2.1-gallon fuel tank which is very good indeed. The brakes are sufficient and include a 200mm disc up front and a drum at the rear. The brake lights feature LED illumination and this is good for both safety and looks. The small 11-inch wheels are fitted with Michelin City tires which provided all the grip we needed. An analog speedometer dominates the instrument cluster above a blue backlit LCD screen. Riding around a big city on a Vespa never feels wrong and despite what Honda claims I argue that you also meet the nicest people on a Vespa. The engine-mounted swing-arm and front suspension upgrades provide a plush ride with very little vibrations. The Primavera stays properly old-school and thankfully doesn’t have TC, ABS or other weight/cost adding things that you frankly don’t need on a lightweight city scooter. 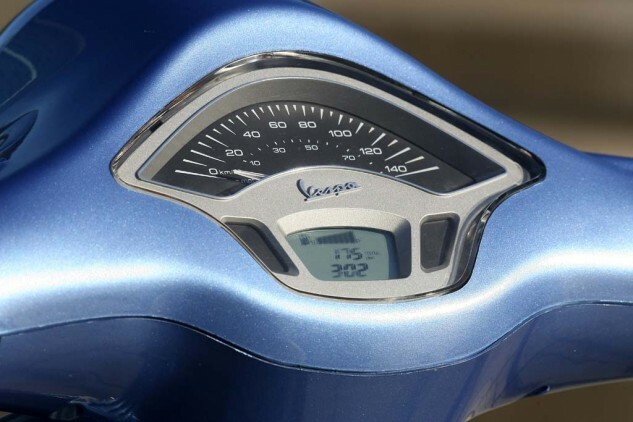 The Vespa Primavera is one smart cookie and is a good addition to anybody’s garage.